Two in one, the solution for maximum mobility... The Max 2 add-on power system by AAT (Alber Antriebstechnik) makes your daily life easy and improves your quality of life. 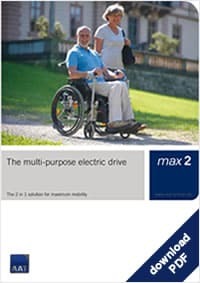 With the Max 2 dual control option add-on power unit provides you with all the Advantages of a light electrical power kit which can also be used as a pushing and braking aid. 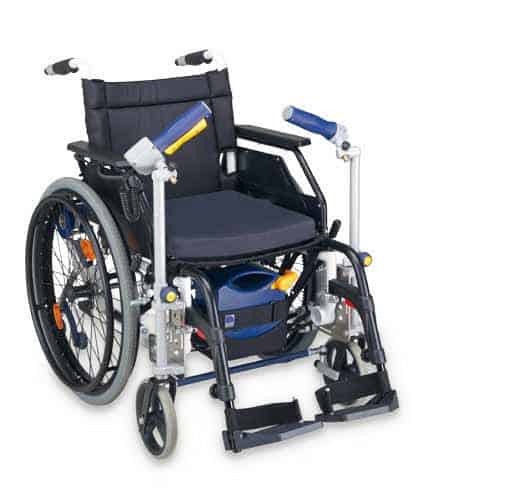 The steering does not work by joystick as usual, but in the classic way by means of two grips which are attached to the front part of the wheelchair. A horizontal bar connects both steering wheels controlling the wheelchair. This way the wheelchair can even be turned almost on the spot. Both grips are ergonomically designed and can be Adjusted to any position the user finds comfortable. The grip is equipped with all important functions necessary to manoeuvre the wheelchair facilitating the device’s handling enormously. A safety chip functioning as an immobiliser system makes unauthorized use impossible. Should you want to use the max 2 as a pushing and braking aid, you merely need to relocate the grips and remove the horizontal bar. Of course you can also always use your wheelchair manually. The components of the max 2 take up very little space and are easily stored in your vehicle.